I went grocery shopping at Safeway today & got some really good deals. I am really happy. I saved over 50% on my grocery bill! I have the bread for next week freshly baked on the kitchen counter. It is Crescent Dragonwagon's Rabbit Hill Inn Oatmeal Molasses Bread- From her Soup & Bread book (excellent). -Tomorrow for our main meal, we'll have the Red Snapper that was on sale today. We will simply saute the fillets in olive oil, salt & peppered & then add a bit of white wine, diced tomatoes, chopped rosemary & capers. We'll eat some asparagus on the side. Monday - Pea Soup with Caraway Adelle, Oatmeal Bread & Salad. This is also a Crescent Dragonwagon recipe. I have not tried it yet. So, if it is good, I'll type it out for you guys! Tuesday - Milk Braised Pork, Polenta & Salad - this pork is slow cooked with milk, sage & lemon peel. That's about it... But, it is tasty! Look how grown up my babies are!! True, Peyton didn't color like this for very long. But, he wanted to sit up at the kid's table so badly. He loves to tag along with Gillian all day long. Peyton hasn't been brave enough to take steps on his own. He stands by himself easily, without even pulling up on anything, but he doesn't want to take steps. He is a real speed crawler. Maybe walking doesn't seem worth it, just yet. We wonder if maybe not walking is starting to frustrate him, though. I don't know. A lot gets him angry now days. He has been displaying quite a temper. His tantrums can be so dramatic, that it's a little bit funny. He seems to be trying to talk already. He has some sort of "word" for Dad, Mom & dogs. He has been slowly getting some teeth over the last few months. He has 4 on the top & 2 on the bottom now. Not all of them are all the way out yet. He loves to eat. Nearly all the time. He has learned to blow on his food. It is pretty cute. This morning he was even blowing on his frozen peas. He is very good at playing ball, both catching & throwing. And, he loves playing chase. So, I got mentioned on Saffron & Genevieve, and it is an honor! Check it out! I had a good time at the trunk show, meeting new people & browsing lovely things. These are Stacy's cool creations. And these are Katie's beauties. But, I have been converted to a lover of at least one variety. Nothing compares to the earthy smokiness of a morel. I was blown away. This was something I learned a week ago, on Valentine's day. I forgot to post our meal of love. I made this Beef with Morel & Tarragon-Marsala Sauce. My thought was, Scott loves mushrooms & I never make them for him. So, I'll do it. Heck. It's Valentine's day. I love this man. I'll make him a mushroom sauce. I'll just eat my meat without it. But, I was brave. I tried one. Out of this world. Amazing. I have never had a better filet mignon dish. What a lesson. Not all mushrooms are equal. This was nothing like a button, or a Portabella, or a Shitake, or an Oyster. 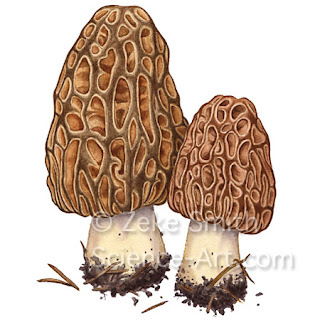 I fell in love with the Morel on Valentine's day, thanks to my true love, Scott. I get to be in a "wedding trunk show" today, with a floral display. And, it is not just any trunk show. It is this one at Saffron & Genevieve. If you have a chance, you should come - even if you have no plans to have a wedding in the near future. There will be champagne punch! Gillian has been anxious to see the flowers all morning. She was very glad to have some time with the baby flowers. We are changing some things in our house. We are living more like the farmers. I am now trying to make sure to serve breakfast. Not just expensive, non-satisfying cold cereal. Something heartier. This week I made both granola & bread. But, the bigger change.... We now eat our main meal at midday. And then, only a light dinner. This is really only our third day on the new schedule. But, so far so good. Eating a lighter dinner has been sufficient. We haven't been feeling hungry. But rather, much better without eating too much heavy food right before sleeping. I thought it might be too hard, schedule-wise, since I usually end up having to run an errand in the morning, too. But, with planning ahead, so far, it has worked fine. It even seems easier, since the kids are much more cranky in the evening, when I was trying to make dinner before. We started doing this with the idea it would be better for us. I think it is better for our metabolism and digestion. I certainly have less terrible pregnancy heartburn at bedtime. Anyway. We'll see if we can keep this up! Side note... We had Peyton's birthday party last weekend & I have lost the memory card with the pictures. Pray I find it! If I do, I'll post some! When you leave a pen in the laundry & ink gets on everything? Or when you finally sweep a really dusty corner & then can't stop sneezing & sniffling the rest of the day? Or when you decide to just trim your bangs yourself because who wants to pay for something so simple - and then you do a total hack job? Or when you go in to get your son up from a nap & he is smearing poo all over his body & the white crib bumper & it is just absolutely everywhere? Try these wings. We are eating them today. They are so yummy!